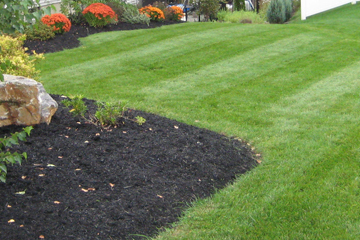 Our lawn maintenance program can help to establish your lawn as the best on the block. Consists of mowing the lawn at an appropriate height considering the time of season and recent weather conditions. Trimming all edges, flower beds, along walkways and fences etc...All hard surfaces will be blown off at the end of each visit. Core aeration of a lawn helps to promote healthy growth and develop a healthy root system by pulling plugs of soil from the soil to help alleviate any compaction of the turf while simultaneously allowing oxygen, water and other nutrients essential to turf health penetrate deep into the root system. Core aeration is typically performed in the fall in conjunction with overseeding for best results. 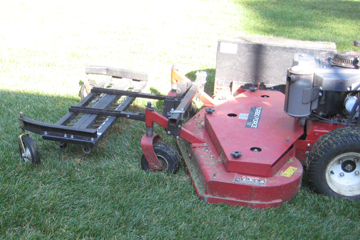 Dethatching removes excessive thatch from a lawn which allows healthy turf to flourish. Thatch is the buildup of previous year�s dead growth and can add up quickly over several years. Fertilization programs catered to your lawns needs help your lawn to establish itself and maintain its healthy green thick features to make your neighbors green with envy!